Seitan isn’t something I use in a lot of my cooking, but since I’m not too keen on most meat substitutes, when I do use seitan, I’m so very glad it exists. Seitan is pretty much the perfect substitute for poultry. You can substitute it ounce-for-ounce, cup-for-cup anytime you have a recipe that calls for chicken or turkey. And you don’t need to make many (or any!) adjustments to the recipe either–that alone is reason to hail love seitan. 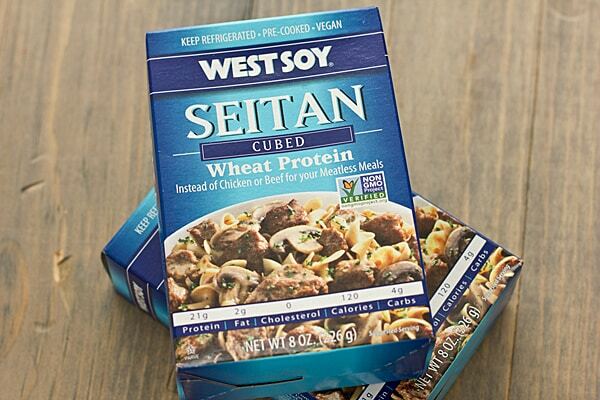 Seitan is made from wheat gluten, so if you’re on a gluten-free diet, you’re going to have to steer clear. It has a savory yet unassertive flavor that makes it the perfect addition to a variety of dishes. It also has a chewy, meaty texture. If you’re looking for a meat substitute that’s not a faux meat but still has that same mouthfeel, seitan is the way to go. You can find seitan sold in big slabs, slices, or small cubes–I usually buy the slices or cubes for the sake of convenience. Open up the package, drain out the liquid, and you’re good to go. Unfortunately, seitan isn’t an ingredient that’s easy to find everywhere. I have to go into the city to get mine, which is the main reason I don’t cook with it all the time. Let’s be real, if I went to my small town grocery store and asked the produce guy, “Hey, where can I find seitan?”, I’d probably get some looks. Of course, if you can’t buy it locally, you can make it yourself too, although I haven’t tried it personally. This Seitan Cacciatore recipe is the perfect example of how easy it is to use seitan to make a recipe meatless. The original Chicken Cacciatore recipe from Eating Well called for 16 ounces of chicken; I used 16 ounces of seitan. See? Simple! Serve this vegetarian cacciatore over brown rice, couscous or pasta. Adapted from Eating Well’s Quick Chicken Cacciatore. 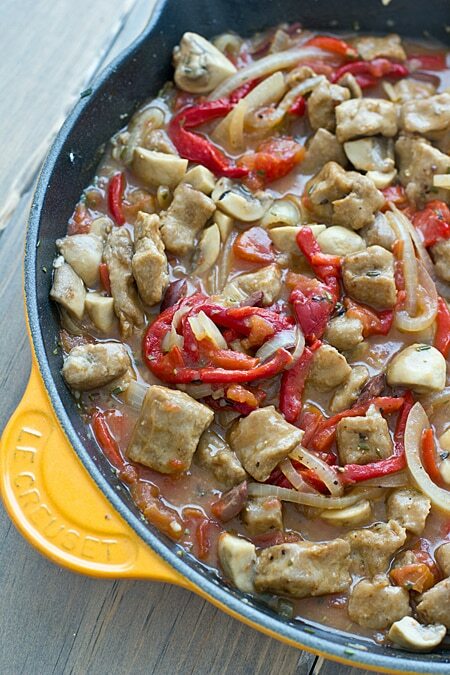 Place seitan in a large bowl. Slowly add 2 tablespoons of flour to bowl, stirring to coat all sides of seitan pieces. Sprinkle with 1/8 teaspoon of salt and pepper. Heat 1 tablespoon of oil in a large skillet over medium heat. Add seitan and cook until browned on all sides, stirring often, about 3-5 minutes. Transfer to plate. Return skillet to medium heat and add remaining tablespoon of oil. Add mushrooms, onion, rosemary, and remaining salt. Cook until onion is golden brown, about 5 minutes. Sprinkle vegetables with remaining flour and stir until coated. Stir in wine and cook for 1 minute. Add tomatoes, broth, roasted red peppers, and olives; reduce heat to medium low. Once cacciatore comes to a simmer, add seitan. Continue to cook, stirring occasionally, until sauce has thickened, about 5 minutes. Serve over brown rice, couscous, or pasta and garnish with rosemary. Love it…you educate me about new things to try, make me laugh and make me hungry! You should make your own seitan. Often. It really is simple to do. My 11 year old son loves to make it with me. He makes the seitan while I chop vegies and get the broth going. One of my family’s favourite meals is Chicken Cacciatore–now I’ll get to enjoy it, too! 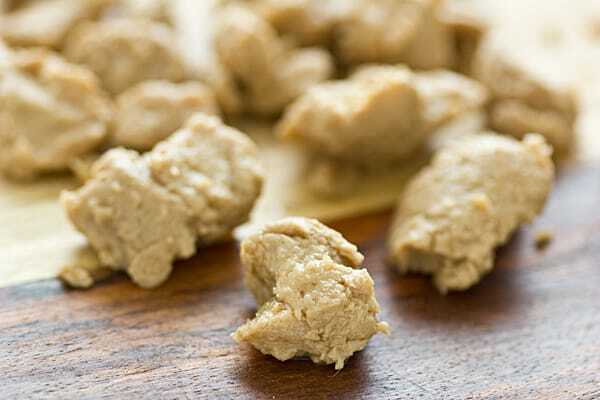 As for seitan…as we live in the region of the Bible belt, I have tried to pronounce it differently so as to avoid raised eyebrows, but your conversation with your hubby has kind of straightened me out on that! Years ago, I tried making seitan from scratch, running the gooey mixture under the cold tap, squeezing out the excess water and all…now I usually resort to a box of Red Mill’s Vital Wheat Gluten which is basically just mix and use. This week, however, I think I’ll substitute ceci (Italian for garbanzo beans/chickpeas) and see how that goes. 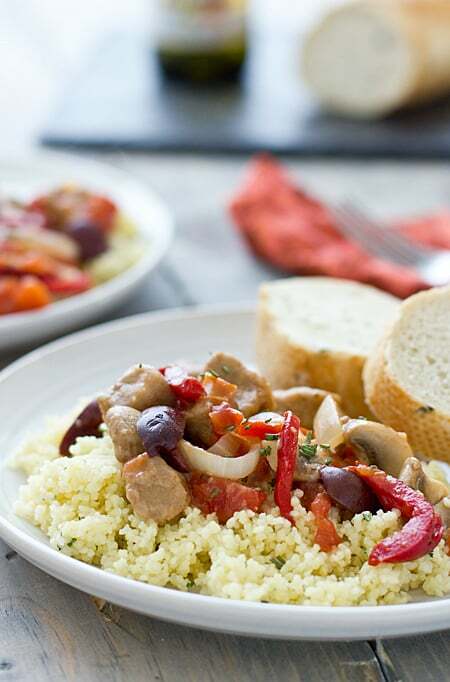 Looking forward to some yummy Chickpea Cacciatore over couscous! I’ve never tried making seitan before, but I should do that one of these days just to say that I have. 🙂 I hope you enjoy the recipe with chickpeas! I rarely make dishes as described but I followed the recipe and this was delicious! I had it on Multigrain spaghetti. Yum! !